Click the image above to read a case study of one of our actual limestone restoration jobs and view compelling images of our processes. Our professional limestone floor and surface care and maintenance services for residential properties include expert interior and exterior cleaning and sanitizing, honing and polishing, repairs, sealing and protection, and more. Is your limestone floor too dull or too shiny? We can give your floor a gloss, semi-gloss or matte finish or restore your existing finish. Are your tiles uneven? We can create a flat, level surface using state-of-the art diamond grinding technology. Are wear patterns, scratches, etches or spots dulling the once gorgeous surface of your limestone? We can hone and polish your limestone surfaces to eliminate these imperfections, resulting in a new limestone surface free of damage. Do you have chipped limestone tiles? Are there cracks in your floor? What about broken limestone tiles? Before you replace your limestone, consider having us provide expert limestone repair services. 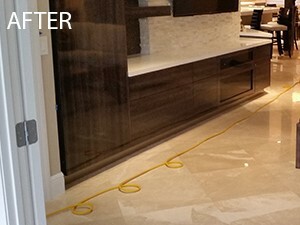 We can fill holes in limestone, fix limestone cracks and chips, blending the repair site with the surrounding area, then honing and polishing it to match the finish on the rest of your limestone floor, countertop or other stone surface. Once your limestone floors, showers, tub surrounds, walls, and other marble surfaces are restored, we highly recommend you have us seal them to enhance their stain resistance. Marble Plus Floorcare also offers the recommended care products to keep your stone looking its best. Give us a call today at (561) 641-4505 for a FREE estimate on your limestone cleaning, polishing, repair, maintenance, and restoration needs throughout the Palm Beach, Ft. Lauderdale, and Boca Raton area. We look forward to serving you!